There were blank stares from many of the soccer players in the group. You could almost hear them silently begging Coach Brunner, “PLEEEASE, don’t call on me.” Some in the group were cautiously hopeful they knew the answers, and, it was obvious from their level of engagement that a handful were feeling confident and excited because they had been taught the soccer numbers – the numbering system – from their club coaches or had educated themselves with a bit of on-line research. This was the scene at a U.S. Soccer Training Center in Virginia when Coach Aaron Brunner, leading the session, started talking soccer tactics and quizzing players on the numbering system that U.S. Soccer has adopted. Based on the response of the group, he had to backtrack a bit and layer in the player numbering system to his training and education for the night. Maybe you had a similar look on your face as these players during the previous World Cups when the TV commentators began bantering about soccer numbers – Michael Bradley playing as a 10 when he’s really more of a 6 or 8, or about Carly Lloyd being asked to play as a 7 when she is clearly the US’s best 10, or of the US Women’s lack of a 6 (enter Morgan Brian). Simply put, the numbering system relates position on the field to numbers. In a 4-3-3, for instance (as portrayed in the post graphic), the right outside back is called a “2” and the defensive midfielder is referred to a “6” and, a soccer number most people have heard of, the playmaking attacker is called a “10”, versus the more target attacker which is a “9”. Talking tactics with soccer numbers is much easier than using position names as the positions are called so many different versions of a name in various systems. 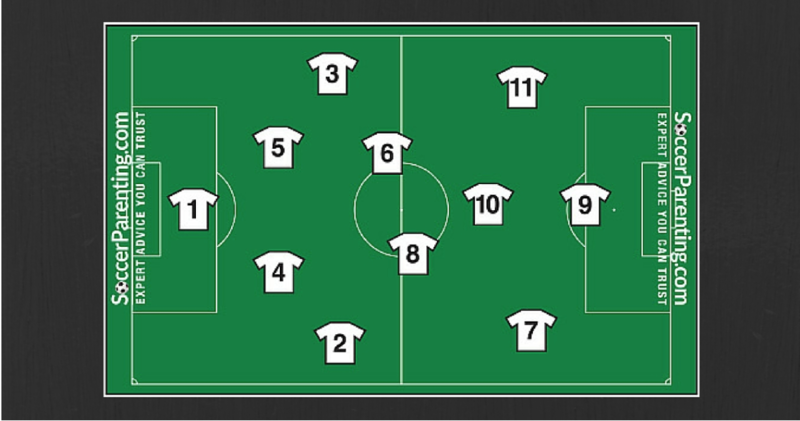 For instance, there is a wing-back, a fullback, an outside back – or simply, there is a “2”. The history of soccer numbers in the game goes back to the 1920’s, so while the concept of a numbering system is certainly not something U.S. Soccer has created, it is a teaching and communication concept that is now being formally implemented in coaching and player education platforms. In 2012, U.S. Soccer created a technical group with the aim of formally addressing and establishing in a philosophy of soccer for the United States. One of the many results of this technical group is the numbering system. While it’s similar to other countries such as England and Germany, it’s not the same. As the use of soccer numbers has begun to trickle into mainstream soccer discussions, not to mention discussions like the one that occurred the other night at the U.S. Soccer Training Center, it’s essential that our children understand the soccer numbers and their respective roles. As parents, it’s important we have a general knowledge of the concept. No need to get carried away and feel you have to “talk-the-talk” with college coaches and say, for instance, “My child is interested in attending your college. He’s usually a 4, but also is comfortable in the 6 and has the speed to play a 2.” However, if the college coach is talking to your child and asks where they like to play on the field and your child answers with numbers instead of position names, I guarantee the coach will appreciate their knowledge of the game. As coaches, we have transitioned from discussing actual positions which are more related to a specific system, to discussing soccer numbers and therefore the characteristics a player brings to the table in relation to what is generally required of that number/role within our individual team’s system of play. When we start to think about the general playing characteristics associated with each number, we start to see how all of this makes sense from coaching tactical perspective, from a scouting and recruiting perspective and from a player education perspective. Coaches, with their new education, are now evaluating the tactical adjustments necessary for their system of play based on the qualities of their players. While recruiting for a college or national team, coaches and scouts can set out to identify and organize the maze of players more easily. For players, they can start to identify with different roles based on their skills and abilities. Believe me, children in Holland grow up dreaming of being the next “7” for the Dutch National Team! It’s uplifting to see that starting to happen in the United States as well. So, what are the soccer numbers as they relate to the positions and what are some basic characteristics of each? The introduction of the numbering system to our coaching and player education is a step in the right direction. The mainstream discussions that are happening through the media and on the sidelines are a clear indication of the continued growth of the game in the United States. These discussions are a benchmark indicator that the United States is becoming more tactically aware. Parents gaining an understanding of the numbering system will certainly continue the momentum. This system doesn’t work, especially on Premier Youth League’s level, where you would have A, B and C teams. All of them cannot have the same numbers (as kids might have to go up a level if they play well), so they end up going up higher and higher in numbers. Then how would a 22 or 35 translate into this system? Gets confusing pretty quickly. HI @Coach I think you have misread the article…the numbers represent positions, not jersey numbers. Re-read the article again under that context and then reach out if you have any further questions! I’ve been a coach for 19 years and I fail to see how the numbering system is easier or clearer than using position names. Quite the opposite. The problem with the numbering system is that they mean different things in different formations. People speak of a number 7 or a number 11 or whatever as though it’s one thing. It depends entirely on the formation. That’s why I still use named positions. I can change formations when needed without having to re-explain the numbers thing. Your football pedagogy needs to be updated NE Soccer Coach. While it is great to know what the numbers represent, i think it is absolutely insane to require all youth soccer organizations across the country to adopt such an in adaptable method of play. I can’t think of a single other sport where your position is dictated by a number. Maybe its just because I’m old and set in my ways, I like positions like stopper/sweeper, which is different (and far more descriptive) than 2 center backs or 4,5. A Wing or wide back, mid, is descriptive, kids get it. Why try to make them code break a command. I personally think this is the dumbest commandment from on high of the National teams. Less than 1% of 1% of kids playing soccer will play in the professional level. Now a kid has to decode, “I want you to play a combination of a 4 and a 6 and be first pressure on defense”, rather than…”play stopper”…or have a generation of kids who want to be #10, cause Messi is 10. In all honesty, if you want to change or influence the youth to fall into a regimented sport education (welcome communism) then you need to have the FIFA video game refer to the players/positions as numbers instead of what has alwasy been done. RB, LB, CB, CAM, DM, LM, RM, ST…I know…so complicated. Lets fix it by using numbers. I think this is a short sighted view. I too come from the 80’s soccer era but I feel quite differently about the number system. I find it to be great system for conveying information quickly to the players. It’s only 10 definitions that you need to understand, this no more complex for them then learning math, science or history in school. You are selling our kids short in terms of their IQ and in turn not allowing them to understand how the world views, plays and educates soccer. Listen, the 1% of the 1% have to start somewhere and if they want to play in the best leagues around the world and come home to play for the national team they will need to understand the language, so to speak. While I respect your opinion of calling positions as CM or CF, that’s how I recall them, I think it’s time to evolve the education, soccer IQ and the sport within the US. It has to be able to be understood first for the players to have fun and develop the skills that allow for coaches to evaluate them later for positions. If in elite travel/HS/college programs you want to refine descriptions with players that have the experience and knowledge — then go for it, but I agree with some of the other commenters that pushing US Soccer ideology down to REC programs is creating confusion and unnecessary complexity. I’d rather teach skills and strategies that build player IQ and translate to success on the field. Shocking stuff on this site. Complete drivel. US folk know very little about football. Sorry, soccer. Thanks for the info. Understanding the number system for player positions helps me to communicate my soccer knowledge/experience (high school, 1980’s) to my daughters in the language they’re getting from their coaches. You have a 4 and 5 center back a 2 and 3 wing backs. With two holding midfielders means you play with two 6’s and then you have a 7 and 11 wide who you ask to push high and an attacking mid 10 and forward 9. A lot of teams play with the two 6’s and a 9 instead of a 6, 8 (box to box) and 9. What’s cool about the numbers is that if you need more attack (maybe it’s the end of the half and you want to push) you can call to the 6’s and say you’d like one of them to play more like an 8 and they will understand with that simple direction. Calvin – I agree with you on double numbering. If you’re up by 2 decide to add a second defensive/holding mid, and if you have taught your players the numbering system and the roles, it’s easy to send in an 8 or instruct your 8 from the sideline to hold. Your 10 could be instructed to drop to center. Same can be done when you down and need to increase attack. Tell your 10 to move to forward. The 8 & 6 “should” naturally play higher due to the extra space in front of them. These are scenarios that should be covered in a practice or 2 so it’s not a surprise. Sky, I like the old ways because it described the position for example the example you give for the 4-5-1 would be: We have 4 defenders which are 2 outer full backs and two center fullbacks or if you prefer a right-center and a left-center fullback. We have 5 midfielders which are the two outer midfielders or outer half-backs, then the right-center and left-center midfielders or right-center and left-center half-backs and the Center midfielder or center half-back. Finally one forward, you can call center-forward or just forward. The names by themselves describe the placing the numbers do not. You can use a number more than 1 time. We say the 2 holding mids are 6s. The attacking is a 10, left and right Backs are 2 and 3. Outside mids are 7 and 11. And the forward is a 9. Interesting that the description of the requirements of each number begins with the NAME of the position. The number system follows the 4-3-3 and the insistence of US coaches on the rigid use of that system is limiting the development of tactical understanding in our youth. As mentioned in other replys , systems like 3-5-2 or 4-4-2 dont fit the numbers well at all. It is easy to say ” we have 2 forwards ” , not easy to say ” we have 2 9’s” if the numbers are supposed to be descriptive of each individual and his/her position. These numbers originated with the WM and zero substitutions and when one considers the number of present day systems and the fluidity involved , numbers leave a lot to be desired. I tend to agree, it’s much easier for kids to continue to learn and play positions based on a good descriptive position name as opposed to a number, particularly if you’re going to go “off script” and double up. At the older ages (HS and above), numbering system may make better sense. This is great provided we are playing a 4-3-3. With the USWNT experimenting with a number of different systems of late, however, the numbering system would of course change as would the demands on and characteristics of some of those players. Creating a more common vocabulary is good, however the idea that we should be locked into a 4-3-3 is one that has never sat well with me. Thanks for what you are doing — but it does get confusing with other formations. 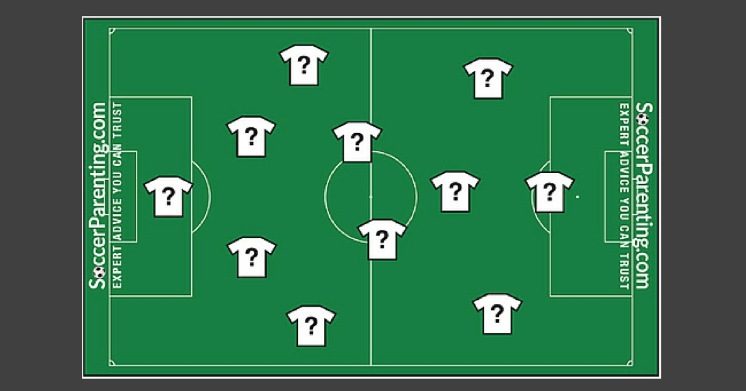 If you play a “straight” 4-4-2, are the CFs both 9’s? Are the CMs 6’s or 8’s or one of each? IOW, there needs to be some guidance on when you double up a number (and what number to drop). And, how much do you want players imagining themselves as “changing number” in the middle/flow of the game? My impression from looking at sites around the world is that almost no one repeats a number (even though that seems the logical thing to do). The only exception I have seen is the use of two 6’s as you mentioned. So any guidance you can provide would be greatly appreciated. If I have my WBs who are also my wide attackers, are they my 7 and 11? Then, how do I number my three CBs? Two 5’s and a 4? Is that how you would number it? If not, how do you think your way through to the “correct” numbering? How would you position the midfield 5? Does the 5 become the holding mid? And who is now the outside mids? Technically, it’s *not* universal, since the US chose to develop its own numbering system, rather than follow one of the (also non-universal) British, European, or Latin American models, which are all based in the requirement that player jersey numbering is formulaic in international play — therefore making it impossible to have, say, two 6s. There’s nothing confusing about saying “we’re playing a 4-3-3 today, so Jimmy and Jane, you’re outside defense, Enrique you’re attacking center mid, and Tanisha you’re center forward,” and so on, unless we choose to make it so; the concepts of defense, midfield, and forward or attack are straightforward, easy to grasp, and completely non-abstract, whereas a number can represent anything. Check out my video for further analysis of the numbering system and see how the USMNT are adopting the same principles of play as some of the top nations and clubs in the world. The video highlights how teams at all age groups apply these principles – from the International level, all the way down to the U10 level. You can also see how my U9’s are beginning to display these principles just after 4 to 5 months of training. Just 4 or 5 months? What a laugh. I get my team 2 weeks before the start of a 2 month fall season.